An Algerian refugee comes to Canada and literally begs for a position as a substitute teacher for a 6th level class. The students are also refugees for the most part and will present a challenge for the teacher, Bashir Lazhar. In a little more than an hour, we learn a lot about Bashir, the school system and the effect on both students and teacher in a class that has seen its share of educators come and go. Are the students that difficult? At times they can be. Is the school too restrictive? It would appear so. Is Bashir overstepping his bounds? Some may say so but he is definitely expanding the minds of the students and getting their attention. Playwright Evelyne de la Cheneliere is a Quebecois playwright from Montreal. This play was adapted into the Academy Award nominated Best Foreign Language film in 2012 and now this translation by Morwyn Brebner, another Canadian playwright, is being staged at Upstream Theatre under the direction of Artistic Director Philip Boehm. Always a unique evening of theatre, Upstream can be counted on for unusual subject matter and some sort of musical background to enhance the story- whether it’s a new work or a classic piece of theatre. This is no exception. Talented local actor, J. Samuel Davis, tackles the role of Bashir Lazhar and mesmerizes us (we, the audience, become his students, after all) as he brings his unique teaching skills to a class obviously used to the usual, repetitious learning by rote. He challenges his students and is genuinely interested in them, their individual stories both in and out of the classroom and their futures. From the opening moments when he is practicing what he will say to his class on opening day (into a bathroom mirror, perhaps?) to his often inept conversations with the school principal, Mr. Davis is a marvel. He takes us on this journey that is both scary and enlightening. The turnover rate of teachers at this institution is incredible because of the difficulty of teaching this mixture of refugee students. It’s obvious that a lot of teachers have just been interested in “crowd control” while others have probably thrown up their hands in despair after failing to teach things the old fashioned way. When a talented and adaptable teacher like Bashir Lazhar comes along, it goes against the grain of the stuffy powers who are afraid of too much change and the age old problem of making students too independent. So he soon becomes another casualty in the ever changing parade of teachers who tackle the sixth graders who may have just tasted their first chance at freedom of thought. 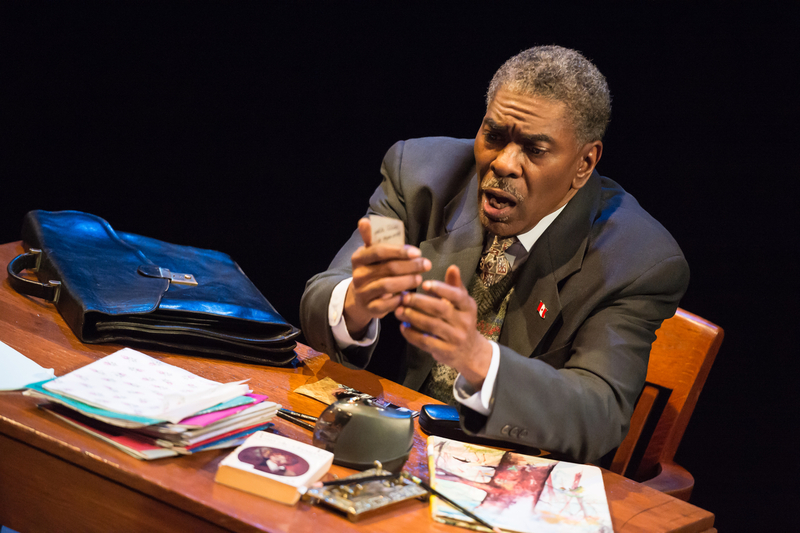 Director Philip Boehm has kept the staging simple and focused on the multi-talented J. Samuel Davis. His desk and a swivel chair become the only props along with a row of lockers that belong to students and teacher alike. Christie Johnston’s set design fits right into the theme of this script. Steve Carmichael’s lights are also simple yet effective. The only other people on stage are the brilliant Farshid Soltanshahi who provides a light, musical background on a series of stringed instruments and one of three girls who make an appearance at the end of the play. Up to this point, Bashir has focused on the audience or imaginary students on stage but we finally see a happy (mostly as a result of her new teacher, obviously) little girl from his class who interacts with him on his final day. On opening night we saw Aliyah Taliaferro in the role. Other nights will feature Eden Harris and Avery Smith. It’s startling but effective to see an actual student after merely “imagining” his students throughout the course of the evening. 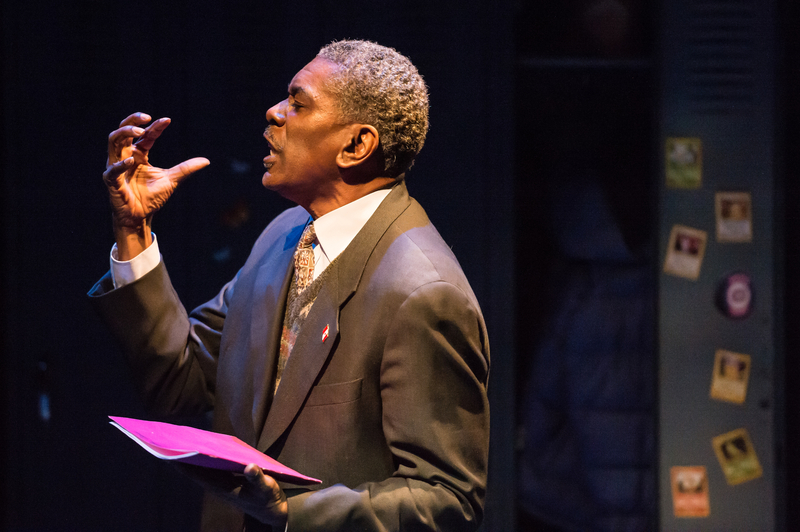 “Bashir Lazhar” runs through February 15th at Upstream Theatre. Give them a call at 314-863-4999 or contact them at upstream theater@sbcglobal.net for tickets or more information. This entry was posted on February 5, 2015 at 9:43 am02 and is filed under Uncategorized. You can follow any responses to this entry through the RSS 2.0 feed. You can leave a response, or trackback from your own site.